The colours in Mauritius seem to be brighter and richer – and this is certainly the case when it comes to the fruit that has been ripened by the warm sun. 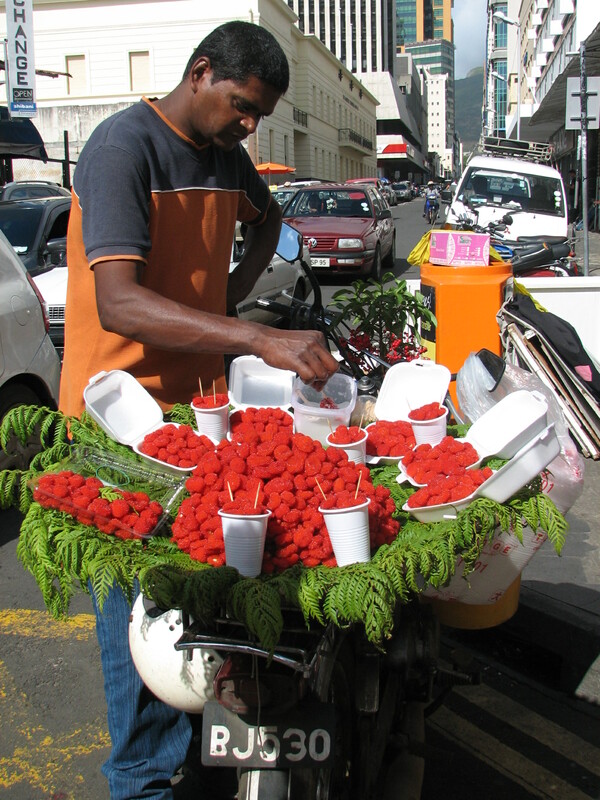 We were spending the day in Port Louis when we came across this hawker selling a brightly coloured fruit that instantly attracted my eye. “That looks delicious,” I told my husband. I had to stop and look closer. The vendor was very gracious as he allowed us to snap pictures of his wares. After taking the pictures, my husband searched in his pockets for some rupees so that we could taste the richly-coloured fruit. I did not take any of the sugar the vendor offered to sprinkle on top of the fruit. Instead I savoured the tangy taste of sun-ripened fruit. Eating the fruit on the side of the road was definitely a treat. 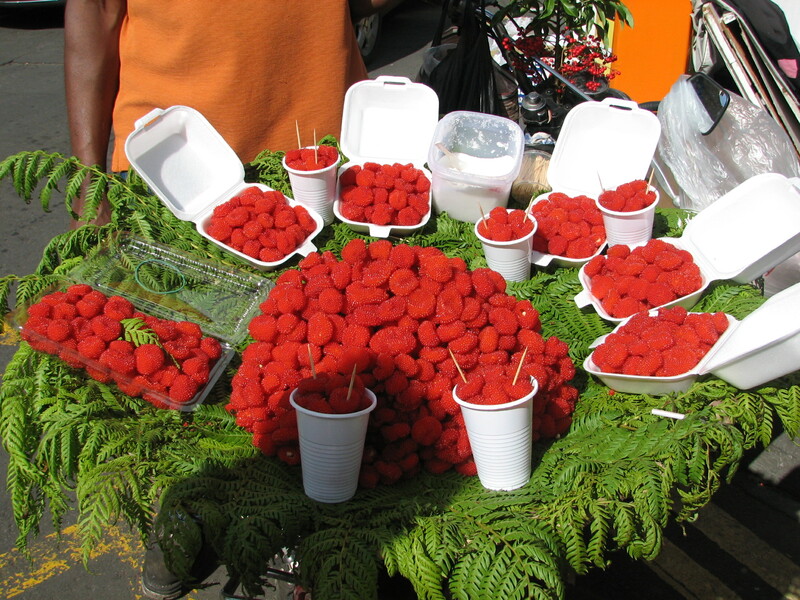 Are you tempted to buy fruit from sidewalk vendors? Raspberries? They look so fresh and delicious. They were – the best I had ever tasted. I buy fruit from street vendors all the time. Today it was apples. 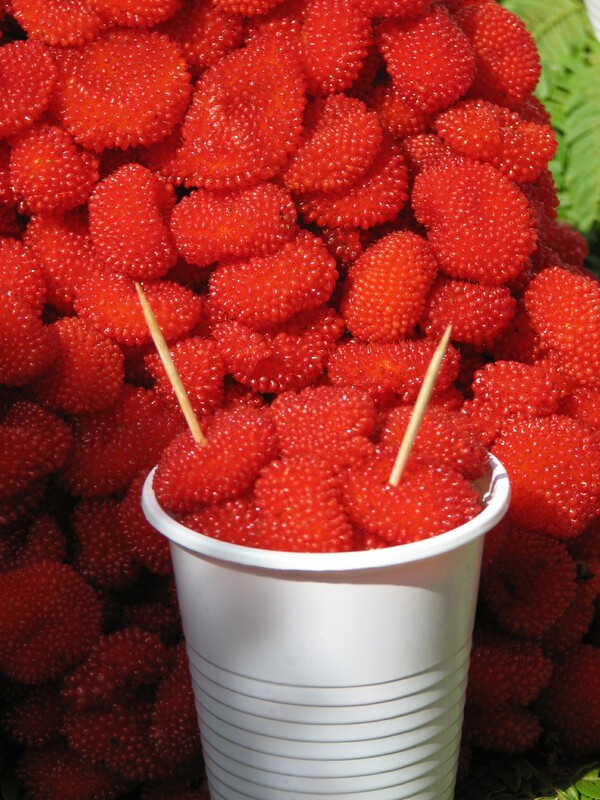 More ‘beret’ Lol shaped raspberries than ours Colline , but my word they look juicy and irresistible ! They were juicy, tangy and calling to be tasted! This is the colour as we saw it – no alterations or playing with filters. It is the colour that drew my eye to them as we were walking down the road. We used to here but can’t take that chance anymore as some of them tried to poison people. Now we just buy from the farmers at Jasmyn or from the supermarkets. Such a pity Sonel as I remember there being quite a few fruit vendors near where you live. I have never seen a fruit like this, I will have to research this. I have relatives who traveled extensively through the world and they taught us that some times this can be risky and have consequences. I have found that when visiting the less developed countries that they are not so concerned about their wares being made public world-wide. It always is. And it is always so tasty. I like, too, that I am supporting someone who is trying to earn their living. They look so beautiful and delicious! Especially the last photo. Just for the bright colors alone I would have to try those! Beautiful! It was delicious Nia. And such a treat. We love strawberries too. And cherries? Yum! I think they are a different variety. I think, too, that the sun helps to make them grow bigger as many other fruits found there are larger than what I find in supermarkets here. Good soil too maybe. Anyway, lucky you. These raspberries look different than the ones I eat here. These look more like red caviar :D. A lovely, bright post, Colline! 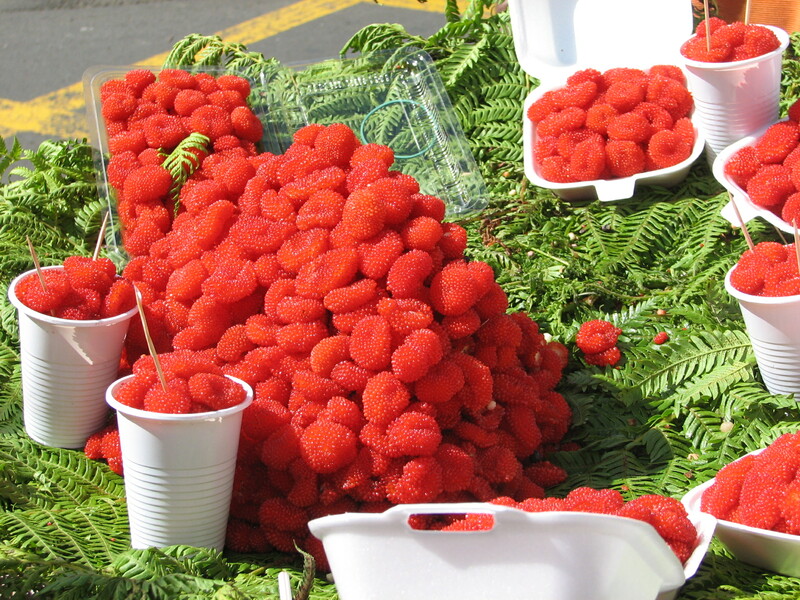 The color of the raspberries is stunning, I only know them from the supermarket or grocery, it must be lovely to buy fresh fruit the way you show on your beautiful pictures. That is what makes going on vacation there such a treat as it is not something we get the opportunity to do where we live. Colline, this is how we should be eating from the lushness of fruit and veg’s. I agree. It brings us closer to the time the fruit was picked. Love the colors …. and yes, I buy from a street vendor. Meanwhile, I’m trying to make my rounds after my break. Hope all is well. A little too busy for my liking as I do not have the time to blog at the moment. I miss communicating with the blogging community every day. Those bright red colors are so irresistible I will be tempted to buy if I was there. I don’t mind buying from sidewalk hawkers if it were fruits that I buy. Thanks for sharing this. I have also bought vegetables in the past when I lived in South Africa in order to support the people who were trying to make a honest living. Wow. I’m impressed with the creativity involved in turning a motor bike into a vendor’s stand that makes the fruit appear this attractively appealing! This proves how you can make do with what you have. Many would say that they couldn’t street vend because they do not have the means to sell the wares. ‘Outside the box thinking’ at work here. The many ways in which people transport their wares would not be accepted here in Canada. I am sure this vendor would be stopped, ticketed and fined over here. I was thinking the same. In other countries, there are less restrictions on survival methods and acceptable ways of earning a living. Some people wonder why others do not seem to do well in a developed country, while others do remarkably well. One summer while a student and single mom, I considered selling juicy watermelon slices to people walking on the board walk on the beaches or lounging on the sand by the lake. I thought that this would be a great way to connect with other city dwellers, earn some much needed income and also provide a refreshing and healthy alternative to the usual offerings of French fries, soda and ice cream. My plan was to sell the watermelon slices at an unbeatable price of $1 per slice from an ice-filled cooler. I figured I’d sell out fast. As I began to get excited about this idea, I realized that it likely contravened a by-law so I decided not to do it after all. Your story highlights the fact that too many restrictions and laws does restrict creativity. I am sure many other enterprising ideas have withered for this very reason. The richest red in the universe. Mmmmmmm. Wish I could taste those lush berries.